Brothers' Union lifts National Football League trophy. We all have a passion that fuels us to march forward. For some it may be the sweet rhythm of rock 'n' roll or a few gentle strokes of a brush on a canvas. My passion is sports, namely soccer. I developed this love right after I discovered kicking. Having had prior chances to practice on numerous people (namely friends) all throughout my life, I seriously started to take up this sport. Even though I am not an expert in the 'field' of soccer, I strive for that winning moment…the moment of exhilaration when the ball hits the back of the net, when the whole audience cheers in unison and the echo 'Goooooooooooal' roars into eternal space and time. Yes! It is rather nice to score in soccer but that chance is dim when you are not too careful during striking; and that chance is even bleaker when you're playing in central defence. That's my position by-the-way. In my younger days, I always wanted to play in centre-field. I always envied how Pavel Nedved, the 32-year-old Czech midfielder currently playing for Juventus, got so much pace and the angle in his pass. It was almost geometric, every throw and every cross, simply perfect. Zinedine Zidane, playing for Real Madrid, is another mid-fielder who has become a living legend. This Frenchman's ability to bend a game in his favour, even at the last minute, not to mention bending the ball around a host of defenders, has made him a hero in every soccer-fan's eyes. Back to my topic, I was ecstatic when Miller, our captain, told me that we were supposed to have a practice match with this other university. This sort of match has always brought out the kicker in me. Not only were the practice matches really fun, there was no real pressure to succeed, just as long as you could learn to correct the mistakes you made. And boy did we have a lot to learn. Our team had been meeting for practice every day at 7am since last week and we were a lot more organised. We had more stamina and had developed an understanding of 'barrier' that we previously had mistaken for the other person's faults. I guess that's human for you, always brooding over what the other person did and forgetting about your own failings in the process. Unfortunate for Miller, he has to pick up a lot of players as he was on route to the practice field in Motijheel, something like a 'water-pool'. The previous day, a record of eight healthy players managed to squeeze into his purple Toyota. We got to the field half-an-hour late, and quickly figured out the other team hadn't showed up yet. Could our presence have scared them off? Or were they wiser and chose not to play on such a wet field, still soggy from last night's downpour? I was mulling over the first option when I noticed some of them strolling onto the field. Being a practice match, we kicked off with a mix of both reserve and starting players. Most players didn't feel the usual blues at not being in the starting eleven as it gave them a chance to hurl comments at the players. Everyone tried to find a good spot up-front on the sidelines, while the players got together in the centre of the field to shake hands and get themselves introduced to one another. I have no idea why people follow this ritual, as no one really cares. It would be much better if they simply chanted their jersey number so that we would at least differentiate the attackers from the defenders and get a head start on 'marking-out' players. As soon as the match commenced, we had the lead, thanks to our striker Kashef. His skills, thanks mostly to a popular Play Station 2 game 'Winning Eleven' was no match for our opponent's defence as he penetrated them again and again. He made his peace when he had a hat-trick to his name and finally, was substituted by Shantono. Not to be outdone, Shantono too put three past the keeper. The match was full of counter attacks, but our defenders dominated and made sure that the ball didn't get as far as our keeper. Their defence is another story. We won by a landslide, the final score being 8 - 0. We thoroughly congratulated our opponents, not for their performance but for their spirit. But their facial expressions did make us wonder as to what sort of curses were crossing their minds. Still a win is a win and a step closer to our goal: the cup for the Intra-University Champion. But what will be our next step? 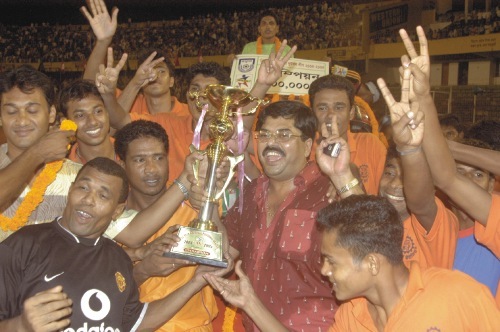 How far can one go in the ladder of soccer in Bangladesh and at what cost? Will I ever be remembered as a legend, if I do make it to the top? Or will I be one of those who catch a glimpse of the peak before someone else comes and climbs over? The soccer scene in Bangladesh is somewhat desolate with more foreign players coming in and less local players going out. One thing that cannot escape the eyes is that soccer admirers are, slowly but surely, being brainwashed into cricket fans. The love for these two sports is so immense that they are even played in the same fields, at the same time, side-by-side. Although Bangladeshis are crazy about soccer, they seem more interested in the English Premier League and Italian Leagues compared to Dhaka's ten-club premier soccer league. "Concentrate on the topic at hand," my mom always says. So, for the time being, I guess I'll keep my mind on the university matches and leave international soccer to others, to the likes of Pele and Maradona.